The Vanderbilt Center for Bone Biology (VCBB) was created to investigate diseases of bone and mineral metabolism. 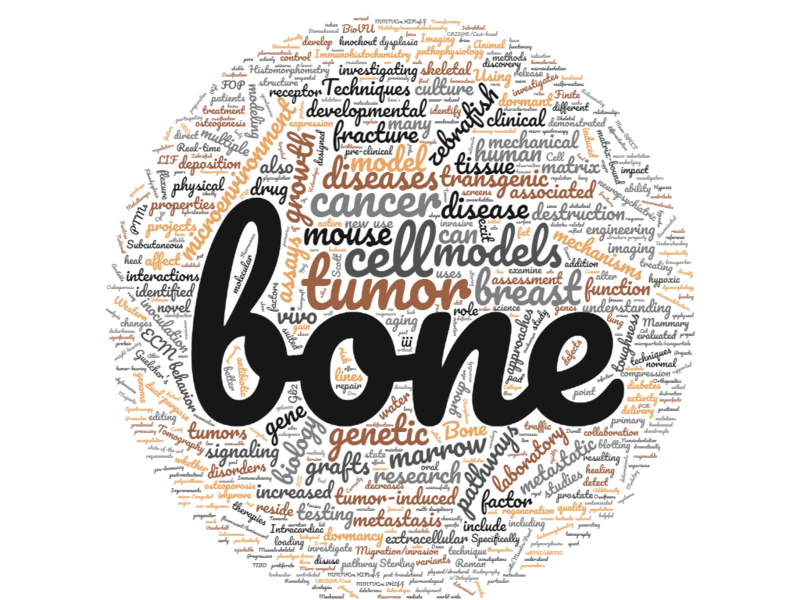 Investigators associated with the VCBB study the mechanisms regulating bone remodeling and repair, cancer-induced bone disease, osteomyelitis, fracture repair, and embryonic bone development. Our goals are to unravel novel biological mechanisms and to develop new treatments and diagnostic tools that can improve the quality of life for patients with bone destruction due to disease or trauma. Access to multiple state-of-the-art instruments and cores at VUMC and Vanderbilt University allows us to perform molecular, cellular and biochemical studies, and to precisely quantify changes in bone volume, architecture, biomechanical properties and histology upon gene alterations, growth, aging, disease, trauma, or pharmacologic treatments. Students from multiple departments, including Medicine, Cancer Biology, Pharmacology, and Engineering are actively involved in this research activity. The active VCBB research program is detailed in the tabs above. Feel free to contact the project leaders or associated students/post-docs if you have questions about projects and if you have interests in joining our group. Repeated in vivo microCT scans from Dr. Dan Perrien's laboratory can be co-registered and used to perform virtual 3D histomorphometry. Bone present in both scans of a mouse tibia is blue, bone formed between the first and second scans is red, and bone resorbed is green. Quantitative imaging analysis of pathologic bone remodeling during S. aureus osteomyelitis from Dr. Jim Cassat's laboratory. A 3D rendering of the infected femur by microCT is depicted (left), and calculations of new bone formation and cortical bone destruction are illustrated in green and yellow, respectively. MDA-MB-231 human breast cancer cells in the bone marrow of a mouse treated with zoledronic acid, from Dr. Julie Sterling's laboratory. Axial compression test of a mouse lumbar vertebra from Dr. Nyman’s lab. Such tests are used to determine the effect of treatment, disease, or gene modification on whole bone strength. Strain distribution for a human trabecular bone core subjected to axial compression as determined micro-CT-derived finite element analysis from Dr. Jeffry Nyman's laboratory. Such calculations identify weak trabeculae (red). Expression of constitutively active Acvr1/Alk2 in Prrx1 expressing cells during gestation results in extensive joint deformity and heterotopic ossification in a 7 day old mouse, from Dr. Dan Perrien's laboratory. Three-dimensional microCT rendering of blood vessels in the mouse lung from Dr. Dan Perrien's laboratory. In addition to bone analysis, microCT has become a powerful tool to analyze vascular volume and structure in a variety of tissues. Human MCF7 breast cancer cells lie dormant in the bone marrow and stain for pimonidazole (a marker for hypoxic, or low oxygen, conditions) along the tumor-bone interface. Work in the Johnson laboratory suggests that very low oxygen levels may promote breast cancer cells to exit dormancy and colonize the bone marrow. Cross sections from Dr. Dan Perrien's laboratory of double calcein labeled tibiae from rats treated with vehicle (left) or an anabolic drug (right) that increases periosteal bone formation. 3D bioluminescent imaging reveals a hypoxia-responsive S. aureus promoter in vivo during osteomyelitis, from Dr. Jim Cassat's laboratory. VCBB faculty Drs. Scott Guelcher, Julie Sterling, and Craig Duvall were recently awarded a grant from the DOD Breast Cancer Research Program to study the use of nanoparticle delivery of potential therapies for bone-metastatic breast cancer. To read the Reporter write-up, please visit the In The News tab.